Rangers third baseman Adrian Beltre hit a homer last night, the 399th of his career, meaning it was time for his soulmate, Elvis Andrus, to attempt one of the most dangerous feats in the game. 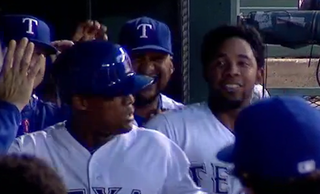 This particular game of Try To Touch Adrian Beltre’s Head was defined by persistence. Andrus took things slow this time, sticking to the shadows and hunting his prey all the way to the end of the dugout. He’s getting good at this.